Charlie Rose: Mr. President thank you very much for this opportunity to talk to you at a very important moment because the President of the United States will address the nation this week and, as you know an important conversation is taking place in Washington and important things are happening here in your country. Do you expect an airstrike? President Al-Assad: As long as the United States doesn’t obey the international law and trample over the Charter of the United Nations we have to worry that any administration – not only this one – would do anything. According to the lies that we’ve been hearing for the last two weeks from high-ranking officials in the US administration we have to expect the worst. Charlie Rose: Are you prepared? President Al-Assad: We’ve been living in difficult circumstances for the last two years and a half, and we prepare ourselves for every possibility. But that doesn’t mean if you’re prepared things will be better; it’s going to get worse with any foolish strike or stupid war. Charlie Rose: What do you mean worse? President Al-Assad: Worse because of the repercussions because nobody can tell you the repercussions of the first strike. We’re talking about one region, bigger regions, not only about Syria. This interlinked region, this intermingled, interlocked, whatever you want to call it; if you strike somewhere, you have to expect the repercussions somewhere else in different forms in ways you don’t expect. Charlie Rose: Are you suggesting that if in fact there is a strike; there will be repercussions against the United States from your friends in other countries like Iran or Hezbollah or others? President Al-Assad: As I said, this may take different forms: direct and indirect. Direct when people want to retaliate, or governments. Indirect when you’re going to have instability and the spread of terrorism all over the region that will influence the west directly. Charlie Rose: Have you had conversations with Russia, with Iran or with Hezbollah about how to retaliate? President Al-Assad: We don’t discuss this issue as a government, but we discuss the repercussions, which is more important because sometimes repercussions could be more destroying than the strike itself. Any American strike will not destroy as much as the terrorists have already destroyed in Syria; sometimes the repercussions could be many doubles the strike itself. Charlie Rose: But some have suggested that it might tip the balance in the favor of the rebels and lead to the overthrow of your government. President Al-Assad: Exactly. Any strike will be as direct support to Al-Qaeda offshoot that’s called Jabhat al-Nusra and the Islamic State of Iraq and Syria. You’re right about this. It’s going to be direct support. Charlie Rose: This is about chemical warfare. Let’s talk about that. Do you approve of the use of chemical warfare, the use of deadly chemicals? Do you think that it is an appropriate tool of war, to use chemicals? President Al-Assad: We are against any WMD, any weapons of mass destruction, whether chemical or nuclear. Charlie Rose: So you’re against the use of chemical warfare? President Al-Assad: Yes, not only me. As a state, as a government, in 2001 we proposed to the United Nations to empty or to get rid of every WMD in the Middle East, and the United States stood against that proposal. This is our conviction and policy. Charlie Rose: But you’re not a signatory to the chemical warfare agreement. President Al-Assad: Because Israel has WMD, and it has to sign, and Israel is occupying our land, so that’s we talked about the Middle East, not Syria, not Israel; it should be comprehensive. Charlie Rose: Do you consider chemical warfare equivalent to nuclear warfare? President Al-Assad: I don’t know. We haven’t tried either. Charlie Rose: But you know, you’re a head of state, and you understand the consequences of weapons that don’t discriminate. President Al-Assad: Technically, they’re not the same. But morally, it’s the same. Charlie Rose: Morally, they are the same. President Al-Assad: They are the same, but at the end, killing is killing. Massacring is massacring. Sometimes you may kill tens of thousands or hundreds of thousands with very primitive armaments. Charlie Rose: Then why do you have such a stockpile of chemical weapons? President Al-Assad: We don’t discuss this issue in public because we never said that we have it, and we never said that we don’t have it. It’s a Syrian issue; it’s a military issue we never discuss in public with anyone. Charlie Rose: This is from the New York Times this morning: Syria’s leaders amassed one of the world’s largest stockpiles of chemical weapons with help from the Soviet Union and Iran as well as Western European suppliers, and even a handful of American companies. According to American diplomatic cables and declassified intelligence records, you have amassed one of the largest supplies of chemical weapons in the world. President Al-Assad: To have or not to have is a possibility, but to depend on what media says is nonsense, or to depend on some of the reports of the intelligence is nonsense and that was proven when they invaded Iraq ten years ago and they said “Iraq has stockpiles of WMD” and it was proven after the invasion that this was false; it was fraud. So, we can’t depend on what one magazine wrote. But at the end, I said it’s something not to be discussed with anyone. Charlie Rose: You accept that the world believes that you have a stockpile of chemical weapons? Charlie Rose: The world. The United States and other powers who also said that you have chemical weapons. President Al-Assad: It isn’t about what they believe in, it’s about the reality that we have, and this reality, we own it, we don’t have to discuss it. Charlie Rose: Speaking of reality, what was the reality on August 21st? What happened in your judgment? President Al-Assad: We’re not in the area where the alleged chemical attack happened. I said alleged. We’re not sure that anything happened. Charlie Rose: Even at this date, you’re not sure that chemical weapons – even though you have seen the video tape, even though you’ve seen the bodies, even though your own officials have been there. President Al-Assad: I haven’t finished. Our soldiers in another area were attacked chemically. Our soldiers - they went to the hospital as casualties because of chemical weapons, but in the area where they said the government used chemical weapons, we only had video and we only have pictures and allegations. We’re not there; our forces, our police, our institutions don’t exist there. How can you talk about what happened if you don’t have evidence? We’re not like the American administration, we’re not social media administration or government. We are a government that deals with reality. When we have evidence, we’ll announce it. Charlie Rose: Well, as you know, Secretary Kerry has said there is evidence and that they saw rockets that fired from a region controlled by your forces into a region controlled by the rebels. They have evidence from satellite photographs of that. They have evidence of a message that was intercepted about chemical weapons, and soon thereafter there were other intercepted messages, so Secretary Kerry has presented what he views as conclusive evidence. President Al-Assad: No, he presented his confidence and his convictions. It’s not about confidence, it’s about evidence. The Russians have completely opposite evidence that the missiles were thrown from an area where the rebels control. This reminds me - what Kerry said - about the big lie that Collin Powell said in front of the world on satellites about the WMD in Iraq before going to war. He said “this is our evidence.” Actually, he gave false evidence. In this case, Kerry didn’t even present any evidence. He talked “we have evidence” and he didn’t present anything. Not yet, nothing so far; not a single shred of evidence. Charlie Rose: Do you have some remorse for those bodies, those people, it is said to be up to at least a thousand or perhaps 1400, who were in Eastern Ghouta, who died? President Al-Assad: We feel pain for every Syrian victim. Charlie Rose: What about the victims of this assault from chemical warfare? President Al-Assad: Dead is dead, killing is killing, crime is crime. When you feel pain, you feel pain about their family, about the loss that you have in your country, whether one person was killed or a hundred or a thousand. It’s a loss, it’s a crime, it’s a moral issue. We have family that we sit with, family that loved their dear ones. It’s not about how they are killed, it's about that they are dead now; this is the bad thing. Charlie Rose: But has there been any remorse or sadness on behalf of the Syrian people for what happened? President Al-Assad: I think sadness prevails in Syria now. We don’t feel anything else but sadness because we have this killing every day, whether with chemical or any other kind. It’s not about how. We feel with it every day. Charlie Rose: But this was indiscriminate, and children were killed, and people who said goodbye to their children in the morning didn’t see them and will never see them again, in Ghouta. President Al-Assad: That is the case every day in Syria, that’s why you have to stop the killing. That’s why we have to stop the killing. But what do you mean by “indiscriminate” that you are talking about? Charlie Rose: Well, the fact that chemical warfare is indiscriminate in who it kills, innocents as well as combatants. President Al-Assad: Yeah, but you’re not talking about evidence, you’re not talking about facts, we are talking about allegations. So, we’re not sure that if there’s chemical weapon used and who used it. We can’t talk about virtual things, we have to talk about facts. Charlie Rose: It is said that your government delayed the United Nations observers from getting to Ghouta and that you denied and delayed the Red Cross then the Red Crescent from getting there to make observations and to help. President Al-Assad: The opposite happened, your government delayed because we asked for a delegation in March 2013 when the first attack happened in Aleppo in the north of Syria; they delayed it till just a few days before al-Ghouta when they sent those team, and the team itself said in its report that he did everything as he wanted. There was not a single obstacle. Charlie Rose: But they said they were delayed in getting there, that they wanted to be there earlier. President Al-Assad: No, no, no; there was a conflict, there was fighting, they were shooting. That’s it. We didn’t prevent them from going anywhere. We asked them to come; why to delay them? Even if you want to take the American story, they say we used chemical weapons the same day the team or the investigation team came to Syria; is it logical? It’s not logical. Even if a country or army wanted to use such weapon, they should have waited a few days till the investigation finished its work. It’s not logical, the whole story doesn’t even hold together. Charlie Rose: We’ll come back to it. If your government did not do it, despite the evidence, who did it? President Al-Assad: We have to be there to get the evidence like what happened in Aleppo when we had evidence. And because the United States didn’t send the team, we sent the evidence to the Russians. Charlie Rose: But don’t you want to know the answer, if you don’t accept the evidence so far, as to who did this? President Al-Assad: The question is who threw chemicals on the same day on our soldiers. That’s the same question. Technically, not the soldiers. Soldiers don’t throw missiles on themselves. So, either the rebels, the terrorists, or a third party. We don’t have any clue yet. We have to be there to collect the evidences then we can give answer. Charlie Rose: Well, the argument is made that the rebels don’t have their capability of using chemical weapons, they do not have the rockets and they do not have the supply of chemical weapons that you have, so therefore they could not have done it. President Al-Assad: First of all, they have rockets, and they’ve been throwing rockets on Damascus for months. Charlie Rose: That carry chemical weapons? President Al-Assad: Rockets in general. They have the means - first. Second, the sarin gas that they’ve been talking about for the last weeks is a very primitive gas. You can have it done in the backyard of a house; it’s a very primitive gas. So, it’s not something complicated. Charlie Rose: But this was not primitive. This was a terrible use of chemical weapons. President Al-Assad: Third, they used it in Aleppo in the north of Syria. Fourth, there’s a video on YouTube where the terrorists clearly make trials on a rabbit and kill the rabbit and said “this is how we’re going to kill the Syrian people.” Fifth, there’s a new video about one of those women who they consider as rebel or fighter who worked with those terrorists and she said “they didn’t tell us how to use the chemical weapons” and one of those weapons exploded in one of the tunnels and killed twelve. That’s what she said. Those are the evidence that we have. Anyway, the party who accused is the one who has to bring evidences. The United States accused Syria, and because you accused you have to bring evidence, this first of all. We have to find evidences when we are there. Charlie Rose: What evidence would be sufficient for you? President Al-Assad: For example, in Aleppo we had the missile itself, and the material, and the sample from the sand, from the soil, and samples from the blood. Charlie Rose: But the argument is made that your forces bombarded Ghouta soon thereafter with the intent of covering up evidence. President Al-Assad: How could bombardment cover the evidence? Technically, it doesn’t work. How? This is stupid to be frank, this is very stupid. Charlie Rose: But you acknowledge the bombardment? President Al-Assad: Of course, there was a fight. That happens every day; now you can have it. But, let’s talk… we have indications, let me just finish this point, because how can use WMD while your troops are only 100 meters away from it? Is it logical? It doesn’t happen. It cannot be used like this. Anyone who’s not military knows this fact. Why do you use chemical weapons while you’re advancing? Last year was much more difficult than this year, and we didn’t use it. Charlie Rose: There is this question too; if it was not you, does that mean that you don’t have control of your own chemical weapons and that perhaps they have fallen into the hands of other people who might want to use them? President Al-Assad: That implies that we have chemical weapons, first. That implies that it’s being used, second. So we cannot answer this question until we answer the first part and the second part. Third, let’s presume that a country or army has this weapon; this kind of armaments cannot be used by infantry for example or by anyone. This kind of armament should be used by specialized units, so it cannot be in the hand of anyone. Charlie Rose: Well, exactly, that’s the point. President Al-Assad: Which is controlled centrally. Charlie Rose: Ah, so you are saying that if in fact, your government did it, you would know about it and you would have approved it. President Al-Assad: I’m talking about a general case. Charlie Rose: In general, you say if in fact it happened, I would have known about it and approved it. That’s the nature of centralized power. President Al-Assad: Generally, in every country, yes. I’m talking about the general rules, because I cannot discuss this point with you in detail unless I’m telling you what we have and what we don’t have, something I’m not going to discuss as I said at the very beginning, because this is a military issue that could not be discussed. Charlie Rose: Do you question the New York Times article I read to you, saying you had a stockpile of chemical weapons? You’re not denying that. President Al-Assad: No, we don’t say yes, we don’t say no, because as long as this is classified, it shouldn’t be discussed. Charlie Rose: The United States is prepared to launch a strike against your country because they believe chemical weapons are so abhorrent, that anybody who uses them crosses a red line, and that therefore, if they do that, they have to be taught a lesson so that they will not do it again. President Al-Assad: What red line? Who drew it? Charlie Rose: The President says that it’s not just him, that the world has drawn it in their revulsion against the use of chemical weapons, that the world has drawn this red line. President Al-Assad: Not the world, because Obama drew that line, and Obama can draw lines for himself and his country, not for other countries. We have our red lines, like our sovereignty, our independence, while if you want to talk about world red lines, the United States used depleted uranium in Iraq, Israel used white phosphorus in Gaza, and nobody said anything. What about the red lines? We don’t see red lines. It’s political red lines. Charlie Rose: The President is prepared to strike, and perhaps he’ll get the authorization of Congress or not. The question then is would you give up chemical weapons if it would prevent the President from authorizing a strike? Is that a deal you would accept? President Al-Assad: Again, you always imply that we have chemical weapons. Charlie Rose: I have to, because that is the assumption of the President. That is his assumption, and he is the one that will order the strike. President Al-Assad: It’s his problem if he has an assumption, but for us in Syria, we have principles. We’d do anything to prevent the region from another crazy war. It’s not only Syria because it will start in Syria. Charlie Rose: You’d do anything to prevent the region from having another crazy war? President Al-Assad: The region, yes. Charlie Rose: You realize the consequences for you if there is a strike? President Al-Assad: It’s not about me. It’s about the region. Charlie Rose: It’s about your country, it’s about your people. President Al-Assad: Of course, my country and me, we are part of this region, we’re not separated. We cannot discuss it as Syria or as me; it should be as part, as a whole, as comprehensive. That’s how we have to look at it. Charlie Rose: Some ask why would you do it? It’s a stupid thing to do if you’re going to bring a strike down on your head by using chemical weapons. Others say you’d do it because A: you’re desperate, or the alternative, you do it because you want other people to fear you, because these are such fearful weapons that if the world knows you have them, and specifically your opponents in Syria, the rebels, then you have gotten away with it and they will live in fear, and that therefore, the President has to do something. President Al-Assad: You cannot be desperate when the army is making advances. That should have happened – if we take into consideration that this presumption is correct and this is reality – you use it when you’re in a desperate situation. So, our position is much better than before. So, this is not correct. Charlie Rose: You think you’re winning the war. President Al-Assad: “Winning” is a subjective word, but we are making advancement. This is the correct word, because winning for some people is when you finish completely. Charlie Rose: Then the argument is made that if you’re winning, it is because of the recent help you have got from Iran and from Hezbollah and additional supplies that have come to your side. People from outside Syria supporting you in the effort against the rebels. President Al-Assad: Iran doesn’t have any soldier in Syria, so how could Iran help me? President Al-Assad: That’s all before the crisis. We always have this kind of cooperation. Charlie Rose: Hezbollah, Hezbollah fighters have been here. President Al-Assad: Hezbollah fighters are on the borders with Lebanon where the terrorists attacked them. On the borders with Lebanon, this is where Hezbollah retaliated, and this is where we have cooperation, and that’s good. Charlie Rose: Hezbollah forces are in Syria today? President Al-Assad: On the border area with Lebanon where they want to protect themselves and cooperate with us, but they don’t exist all over Syria. They cannot exist all over Syria anyway, for many reasons, but they exist on the borders. Charlie Rose: What advice are you getting from the Russians? Charlie Rose: About this war, about how to end this war. President Al-Assad: Every friend of Syria is looking for peaceful solution, and we are convinced about that. We have this advice, and without this advice we are convinced about it. Charlie Rose: Do you have a plan to end the war? President Al-Assad: At the very beginning, it was fully political. When you have these terrorists, the first part of the same plan which is political should start with stopping the smuggling of terrorists coming from abroad, stopping the logistic support, the money, all kinds of support coming to these terrorists. This is the first part. Second, we can have national dialogue where different Syrian parties sit and discuss the future of Syria. Third, you can have interim government or transitional government. Then you have final elections, parliamentary elections, and you’re going to have presidential elections. Charlie Rose: But the question is: would you meet with rebels today to discuss a negotiated settlement? President Al-Assad: In the initiative that we issued at the beginning of this year we said every party with no exceptions as long as they give up their armaments. Charlie Rose: But you’ll meet with the rebels and anybody who’s fighting against you if they give up their weapons? President Al-Assad: We don’t have a problem. President Al-Assad: Does a government give up its weapons? Have you heard about that before? President Al-Assad: The armament of the government is legal armament. Any other armament is not legal. So how can you compare? It’s completely different. Charlie Rose: There’s an intense discussion going on about all the things we’re talking about in Washington, where if there’s a strike, it will emanate from the United States’ decision to do this. What do you want to say, in this very important week, in America, and in Washington, to the American people, the members of Congress, to the President of the United States? President Al-Assad: I think the most important part of this now is, let’s say the American people, but the polls show that the majority now don’t want a war, anywhere, not only against Syria, but the Congress is going to vote about this in a few days, and I think the Congress is elected by people, it represents the people, and works for their interest. The first question that they should ask themselves: what do wars give America, since Vietnam till now? Nothing. No political gain, no economic gain, no good reputation. The United States’ credibility is is at an all-time low. So, this war is against the interest of the Untied States. Why? First, this war is going to support Al-Qaeda and the same people that killed Americans in the 11th of September. The second thing that we want to tell Congress, that they should ask and that what we expect them to ask this administration about the evidence that they have regarding the chemical story and allegations that they presented. I wouldn’t tell the President or any other official, because we are disappointed by their behavior recently, because we expected this administration to be different from Bush’s administration. They are adopting the same doctrine with different accessories. That’s it. So if we want to expect something from this administration, it is not to be weak, to be strong to say that “we don’t have evidence,” that “we have to obey the international law”, that “we have to go back to the Security Council and the United Nations”. Charlie Rose: The question remains; what can you say to the President who believes chemical weapons were used by your government; that this will not happen again. President Al-Assad: I will tell him very simply: present what you have as evidence to the public, be transparent. Charlie Rose: And if he does? If he presents that evidence? President Al-Assad: This is where we can discuss the evidence, but he doesn’t have it. He didn’t present it because he doesn’t have it, Kerry doesn’t have it. No one in your administration has it. If they had it, they would have presented it to you as media from the first day. Charlie Rose: They have presented it to the Congress. President Al-Assad: Nothing. Nothing was presented. Charlie Rose: They’ve shown the Congress what they have, and the evidence they have, from satellite intercepted messages and the like. President Al-Assad: Nothing has been presented so far. Charlie Rose: They have presented it to the Congress, sir. President Al-Assad: You are a reporter. Get this evidence and show it to the public in your country. President Al-Assad: First of all, we have the precedent of Collin Powell ten years ago, when he showed the evidence, it was false, and it was forged. This is first. Second, you want me to believe American evidence and don’t want me to believe the indications that we have. We live here, this is our reality. Charlie Rose: Your indications are what? President Al-Assad: That the rebels or the terrorists used the chemical weapons in northern Aleppo five months ago. Charlie Rose: And on August 21st? President Al-Assad: No, no, no. That was before. On the 21st, again they used it against our soldiers in our area where we control it, and our soldiers went to the hospital, you can see them if you want. Charlie Rose: But Ghouta is not controlled by your forces, it’s controlled by the rebel forces. The area where that attack took place is controlled by rebel forces. 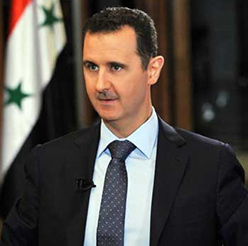 President Al-Assad: What if they have stockpiles and they exploded because of the bombardment? What if they used the missile by mistake and attacked themselves by mistake? Charlie Rose: Let me move to the question of whether a strike happens, and I touched on this before. You have had fair warning. Have you prepared by moving possible targets, are you moving targets within civilian populations, all the things that you might have done if you have time to do that and you have had clear warning that this might be coming? President Al-Assad: Syria is in a state of war since its land was occupied for more than four decades, and the nature of the frontier in Syria implies that most of the army is in inhabited areas, most of the centers are in inhabited areas. You hardly find any military base in distant areas from the cities unless it’s an airport or something like this, but most of the military bases or centers within inhabited areas. Charlie Rose: Will there be attacks against American bases in the Middle East if there’s an airstrike? President Al-Assad: You should expect everything. Not necessarily through the government, the governments are not the only player in this region. You have different parties, different factions, you have different ideologies; you have everything in this region now. So, you have to expect that. President Al-Assad: Expect every action. President Al-Assad: That depends. If the rebels or the terrorists in this region or any other group have it, this could happen, I don’t know. I’m not a fortuneteller to tell you what’s going to happen. Charlie Rose: But we’d like to know more, I think the President would like to know, the American people would like to know. If there is an attack, what might be the repercussions and who might be engaged in those repercussions? President Al-Assad: Okay, before the 11th of September, in my discussions with many officials of the United States, some of them are Congressmen, I used to say that “don’t deal with terrorists as playing games.” It’s a different story. You’re going to pay the price if you’re not wise in dealing with terrorists. We said you’re going to be repercussions of the mistaken way of dealing with it, of treating the terrorism, but nobody expected 11th of September. So, you cannot expect. It is difficult for anyone to tell you what is going to happen. It’s an area where everything is on the brink of explosion. You have to expect everything. Charlie Rose: Let’s talk about the war today. A hundred thousand people dead. A million refugees. A country being destroyed. Do you take some responsibility for that? President Al-Assad: That depends on the decision that I took. From the first day I took the decision as President to defend my country. So, who killed? That’s another question. Actually, the terrorists have been killing our people since the beginning of this crisis two years and a half ago, and the Syrian people wanted the government and the state institutions and the army and the police to defend them, and that’s what happened. So we’re talking about the responsibility, my responsibility according to the Syrian constitution that said we have to defend ourselves. Charlie Rose: Mr. President, you constantly say “it’s terrorists.” Most people look at the rebels and they say that Al-Qaeda and other forces from outside Syria are no more than 15 or 20 percent of the forces on the ground. The other 80% are Syrians, are defectors from your government, and defectors from your military. They are people who are Syrians who believe that their country should not be run by a dictator, should not be run by one family, and that they want a different government in their country. That’s 80% of the people fighting against you, not terrorists. President Al-Assad: We didn’t say that 80%, for example, or the majority or the vast majority, are foreigners. We said the vast majority are Al-Qaeda or Al-Qaeda offshoot organizations in this region. When you talk about Al-Qaeda it doesn’t matter if he’s Syrian or American or from Europe or from Asia or Africa. Al-Qaeda has one ideology and they go back to the same leadership in Afghanistan or in Syria or in Iraq. That’s the question. You have tens of thousands of foreigners, that’s definitely correct. We are fighting them on the ground and we know this. Charlie Rose: But that’s 15 or 20% of this. That’s a realistic look at how many. President Al-Assad: Nobody knows because when they are dead and they are killed, they don’t have any ID. You look at their faces, they look foreigners, but where are they coming from? How precise this estimate is difficult to tell, but definitely the majority are Al-Qaeda. This is what concerns us, not the nationality. If you have Syrian Al-Qaeda, or Pakistani Al-Qaeda or Saudi Al-Qaeda, what’s the difference? What does it matter? The most important thing is that the majority are Al-Qaeda. We never said that the majority are not Syrians, but we said that the minority is what they call “free Syrian army.” That’s what we said. Charlie Rose: Do you believe this is becoming a religious war? President Al-Assad: It started partly as a sectarian war in some areas, but now it’s not, because when you talk about sectarian war or religious war, you should have a very clear line between the sects and religions in Syria according to the geography and the demography in Syria, something we don’t have. So, it’s not religious war, but Al-Qaeda always use religions, Islam - actually, as a pretext and as a cover and as a mantle for their war and for their terrorism and for their killing and beheading and so on. Charlie Rose: Why has this war lasted two and a half years? President Al-Assad: Because of the external interference, because there is an external agenda supported by, or let’s say led by the United States, the West, the petrodollar countries, mainly Saudi Arabia, and before was Qatar, and Turkey. That’s why it lasted two years and a half. Charlie Rose: But what are they doing, those countries you cited? President Al-Assad: They have different agendas. For the West, they wanted to undermine the Syrian positions. For the petrodollar countries like Saudi Arabia, they’re thinking undermining Syria will undermine Iran on sectarian basis. For Turkey, they think that if the Muslim Brotherhood take over the rest of the region, they will be very comfortable, they will be very happy, they will make sure that their political future is guaranteed. So they have different agendas and different goals. Charlie Rose: But at the same time, as I said, you used Hezbollah and got support from Iran, from Russia. So, what is happening here. Is this a kind of war that exists because of support from outside Syria on both sides? President Al-Assad: This is cooperation, I don’t know what you mean by support. We have cooperation with countries for decades. Why talk about this cooperation now? Charlie Rose: Then you tell me, what are you receiving from Iran? President Al-Assad: Political support. We have agreements with many countries including Iran, including Russia, including other countries that are about different things including armament. It’s cooperation like any cooperation between any two countries, which is normal. It’s not related to the crisis. You don’t call it support, because you pay money for what you get. So, you don’t call it support, it’s cooperation, call it whatever you want, but the word “support” is not precise. From Russia for example, we have political support, which is different from the cooperation. We have cooperation for 60 years now, but now we have political support. Charlie Rose: Well, the Russians said they have ongoing support for you, but beyond just political cooperation. I mean they have treaties that existed with Syria. Charlie Rose: And they provide all kinds of defensive weapons. President Al-Assad: You said treaties, and a Russian official said; we have not agreement… contracts, that we have to fulfill, and those contracts are like any country; you buy armaments, you buy anything you want. Charlie Rose: But do you believe this has become a conflict of Sunni vs. Shia’a? President Al-Assad: No, not yet. This is in the mind of the Saudis, and this is in the minds of the Wahabists. Charlie Rose: And in the minds of the Iranians? President Al-Assad: No, no, actually what they are doing is the opposite. They tried to open channels with the Saudi, with many other Islamic entities in the region in order to talk about Islamic society, not Sunni and Shi’ite societies. President Al-Assad: No, for one reason; because the first question that I ask: do I have public support or not. That is the first question that I asked as President. If I don’t have the public support, whether there’s the so-called “Arab spring” – it’s not spring, anyway – but whether we have this or we don’t, if you don’t have public support, you have to quit, you have to leave. If you have public support, in any circumstances you have to stay. That’s your mission, you have to help the people, you have to serve the people. Charlie Rose: When you say “public support” people point to Syria and say a minority sect, Alawites, control a majority Sunni population, and they say “dictatorship” and they do it because it because of the force of their own instruments of power. That’s what you have, not public support, for this war against other Syrians. President Al-Assad: Now, it’s been two years and a half, ok? Two years and a half and Syria is still withstanding against the United States, the West, Saudi Arabia, the richest countries in this area, including Turkey, and, taking into consideration what your question implies, that even the big part or the bigger part of the Syrian population is against me, how can I withstand till today? Am I the superhuman or Superman, which is not the case! Charlie Rose: Or you have a powerful army. President Al-Assad: The army is made of the people; it cannot be made of robots. It’s made of people. Charlie Rose: Surely you’re not suggesting that this army is not at your will and the will of your family. Charlie Rose: The will of your family. Your brother is in the military. The military has been… every observer of Syria believes that this is a country controlled by your family and controlled by the Alawites who are your allies. That’s the control. President Al-Assad: If that situation was correct - what you’re mentioning - we wouldn’t have withstood for two years and a half. We would have disintegration of the army, disintegration of the whole institution in the state; we would have disintegration of Syria if that was the case. It can’t be tolerated in Syria. I’m talking about the normal reaction of the people. If it’s not a national army, it cannot have the support, and if it doesn’t have the public support of every sect, it cannot do its job and advance recently. It cannot. The army of the family doesn’t make national war. Charlie Rose: Some will argue that you didn’t have this support because in fact the rebels were winning before you got the support of Hezbollah and an enlarged support from the Iranians, that you were losing and then they came in and gave you support so that you were able to at least start winning and produce at least a stalemate. President Al-Assad: No, the context is wrong, because talking about winning and losing is like if you’re talking about two armies fighting on two territories, which is not the case. Those are gangs, coming from abroad, infiltrate inhabited areas, kill the people, take their houses, and shoot at the army. The army cannot do the same, and the army doesn’t exist everywhere. Charlie Rose: But they control a large part of your country. President Al-Assad: No, they went to every part there’s no army in it, and the army went to clean and get rid of them. They don’t go to attack the army in an area where the army occupied that area and took it from it. It’s completely different, it’s not correct, or it’s not precise what you’re talking about. So, it’s completely different. What the army is doing is cleaning those areas, and the indication that the army is strong is that it’s making advancement in that area. It never went to one area and couldn’t enter to it - that’s an indication. How could that army do that if it’s a family army or a sect army? What about the rest of the country who support the government? It’s not realistic, it doesn’t happen. Otherwise, the whole country will collapse. Charlie Rose: One small point about American involvement here, the President’s gotten significant criticism because he has not supported the rebels more. As you know, there was an argument within his own counsels from Secretary of State Clinton, from CIA Director David Petraeus, from the Defense Department, Leon Penetta, Secretary of Defense, and others, that they should have helped the rebels two years ago, and we would be in a very different place, so the President has not given enough support to the rebels in the view of many people, and there’s criticism that when he made a recent decision to give support, it has not gotten to the rebels, because they worry about the composition. President Al-Assad: If the American administration want to support Al-Qaeda - go ahead. That’s what we have to tell them, go ahead and support Al-Qaeda, but don’t talk about rebels and free Syrian army. The majority of fighters now are Al-Qaeda. If you want to support them, you are supporting Al-Qaeda, you are creating havoc in the region, and if this region is not stable, the whole world cannot be stable. Charlie Rose: With respect, sir, most people don’t believe the majority of forces are Al-Qaeda. Yes, there is a number of people who are Al-Qaeda affiliates and who are here who subscribe to the principles of Al-Qaeda, but that’s not the majority of the forces as you know. You know that the composition differs within the regions of Syria as to the forces that are fighting against your regime. President Al-Assad: The American officials should learn to deal with reality. Why did the United States fail in most of its wars? Because it always based its wars on the wrong information. So, whether they believe or not, this is not reality. I have to be very clear and very honest. I’m not asking them to believe if they don’t want to believe. This is reality, I’m telling you the reality from our country. We live here, we know what is happening, and they have to listen to people here. They cannot listen only to their media or to their research centers. They don’t live here; no one lives here but us. So, this is reality. If they want to believe, that’s good, that will help them understand the region and be more successful in their policies. Charlie Rose: Many people think this is not a sustainable position here; that this war cannot continue, because the cost for Syria is too high. Too many deaths - a hundred thousand and counting, too many refugees, too much destruction; the soul of a country at risk. If it was for the good of the country, would you step down? President Al-Assad: That depends on the relation of me staying in this position and the conflict. We cannot discuss it just to say you have to step down. Step down, why, and what is the expected result? This is first. Second, when you’re in the middle of a storm, leaving your country just because you have to leave without any reasonable reason, it means you’re quitting your country and this is treason. Charlie Rose: You say it would be treason for you to step down right now because of your obligation to the country? President Al-Assad: Unless the public wants you to quit. Charlie Rose: And how will you determine that? President Al-Assad: By the two years and a half withstanding. Without the public support, we cannot withstand two years and a half. Look at the other countries, look what happened in Libya, in Tunisia and in Egypt. Charlie Rose: You worry about that, what happened to Gaddafi? President Al-Assad: No, we are worried that rebels are taking control in many countries, and look at the results now. Are you satisfied as an American? What are the results? Nothing. Very bad - nothing good. Charlie Rose: There was a report recently that you had talked about, or someone representing you had talked about some kind of deal in which you and your family would leave the country if you were guaranteed safe passage, if you were guaranteed that there would be no criminal prosecution. You’re aware of these reports? President Al-Assad: We had this guarantee from the first day of the crisis. Charlie Rose: Because of the way you acted? President Al-Assad: No, because of the agenda that I talked about. Some of these agendas wanted me to quit, very simply, so they said “we have all the guarantees if you want to leave, and all the money and everything you want.” Of course, you just ignore that. Charlie Rose: So, you’ve been offered that opportunity? President Al-Assad: Yeah, but it’s not about me, again, this fight is not my fight, it’s not the fight of the government; it’s the fight of the country, of the Syrian people. That’s how we look at it. It’s not about me. Charlie Rose: It’s not about you? President Al-Assad: It’s about every Syrian. Charlie Rose: How will this war end? I referred to this question earlier. What’s the endgame? President Al-Assad: It’s very simple; once the Western countries stop supporting those terrorists and making pressure on their puppet countries and client states like Saudi Arabia and Turkey and others, you’ll have no problem in Syria. It will be solved easily, because those fighters, the Syrian part that you’re talking about, lost its natural incubators in the Syrian society - they don’t have incubators anymore; that’s why they have incubators abroad. They need money from abroad, they need moral support and political support from abroad. They don’t have any grassroots, any incubator. So, when you stop the smuggling, we don’t have problems. Charlie Rose: Yeah, but at the same time, as I’ve said before, you have support from abroad. There are those who say you will not be able to survive without the support of Russia and Iran. Your government would not be able to survive. President Al-Assad: No, it’s not me, I don’t have support. Not me; all Syria. Every agreement is between every class and every sector in Syria; government, people, trade, military, culture, everything; it’s like the cooperation between your country and any other country in the world. It’s the same cooperation. It’s not about me; it’s not support for the crisis. Charlie Rose: I mean about your government. You say that the rebels only survive because they have support from Saudi Arabia and Turkey and the United States, and Qatar perhaps, and I’m saying you only survive because you have the support of Russia and Iran and Hezbollah. President Al-Assad: No, the external support can never substitute internal support, it can never, for sure. And the example that we have to look at very well is Egypt and Tunisia; they have all the support from the West and from the Gulf and from most of the countries of the world. When they don’t have support within their country, they couldn’t continue more than – how many weeks? - three weeks. So, the only reason we stand here for two years and a half is because we have internal support, public support. So, any external support, if you want to call it support, let’s use this world, is… how to say… it’s going to be additional, but it’s not the base to depend on more than the Syrian support. Charlie Rose: You and I talked about this before; we remember Hama and your father, Hafez Al-Assad. He… ruthlessly… set out to eliminate the Muslim Brotherhood. Are you simply being your father’s son here? President Al-Assad: I don’t know what you mean by ruthlessly, I’ve never heard of soft war. Have you heard about soft war? There’s no soft war. War is war. Any war is ruthless. When you fight terrorists, you fight them like any other war. Charlie Rose: So, the lessons you have here are the lessons you learned from your father and what he did in Hama, which, it is said, influenced you greatly in terms of your understanding of what you have to do. President Al-Assad: The question: what would you do as an American if the terrorists are invading your country from different areas and started killing tens of thousands of Americans? Charlie Rose: You refer to them as terrorists, but in fact it is a popular revolution, people believe, against you, that was part of the Arab spring that influenced some of the other countries. President Al-Assad: Revolution should be Syrian, cannot be revolution imported from abroad. Charlie Rose: It didn’t start from abroad; it started here. President Al-Assad: These people that started here, they support the government now against those rebels, that’s what you don’t know. What you don’t know as an American you don’t know as a reporter. That’s why talking about what happened at the very beginning is completely different from what is happening now - it’s not the same. There’s very high dynamic, things are changing on daily basis. It’s a completely different image. Those people who wanted revolution, they are cooperating with us. Charlie Rose: I’m asking you again, is it in fact you’re being your father’s son and you believe that the only way to drive out people is to eliminate them the same way your father did? President Al-Assad: In being independent? Yes. In fighting terrorists? Yes. In defending the Syrian people and the country? Yes. Charlie Rose: When I first interviewed you, there was talk of Bashar al-Al-Assad… he’s the hope, he’s the reform. That’s not what they’re saying anymore. Charlie Rose: People who write about you, people who talk about you, people who analyze Syria and your regime. President Al-Assad: Exactly, the hope for an American is different from the hope of a Syrian. For me, I should be the hope of the Syrian, not any other one, not American, neither French, nor anyone in the world. I’m President to help the Syrian people. So, this question should start from the hope of the Syrian people, and if there is any change regarding that hope, we should ask the Syrian people, not anyone else in the world. Charlie Rose: But now they say – their words – a butcher. Comparisons to the worst dictators that ever walked on the face of the Earth, comparing you to them. Using weapons that go beyond warfare. Everything they could say bad about a dictator, they’re now saying about you. President Al-Assad: First of all, when you have a doctor who cut the leg to prevent the patient from the gangrene if you have to, we don’t call butcher; you call him a doctor, and thank you for saving the lives. When you have terrorism, you have a war. When you have a war, you always have innocent lives that could be the victim of any war, so, we don’t have to discuss what the image in the west before discussing the image in Syria. That’s the question. Charlie Rose: It’s not just the West. I mean it’s the East, and the Middle East, and, I mean, you know, the eyes of the world have been on Syria. We have seen atrocities on both sides, but on your side as well. They have seen brutality by a dictator that they say put you in a category with the worst. President Al-Assad: So we have to allow the terrorists to come and kill the Syrians and destroy the country much, much more. This is where you can be a good President? That’s what you imply. Charlie Rose: But you can’t allow the idea that there’s opposition to your government from within Syria. That is not possible for you to imagine. President Al-Assad: To have opposition? We have it, and you can go and meet with them. We have some of them within the government, we have some of them outside the government. They are opposition. We have it. Charlie Rose: But those are the people who have been fighting against you. President Al-Assad: Opposition is different from terrorism. Opposition is a political movement. Opposition doesn’t mean to take arms and kill people and destroy everything. Do you call the people in Los Angeles in the nineties - do you call them rebels or opposition? What did the British call the rebels less than two years ago in London? Did they call them opposition or rebels? Why should we call them opposition? They are rebels. They are not rebels even, they are beheading. This opposition, opposing country or government, by beheading? By barbecuing heads? By eating the hearts of your victim? Is that opposition? What do you call the people who attacked the two towers on the 11th of September? Opposition? Even if they’re not Americans, I know this, but some of them I think have nationality - I think one of them has American nationality. Do you call him opposition or terrorist? Why should you use a term in the Untied States and England and maybe other countries and use another term in Syria? This is a double standard that we don’t accept. Charlie Rose: I once asked you what you fear the most and you said the end of Syria as a secular state. Is that end already here? President Al-Assad: According to what we’ve been seeing recently in the area where the terrorists control, where they ban people from going to schools, ban young men from shaving their beards, and women have to be covered from head to toe, and let’s say in brief they live the Taliban style in Afghanistan, completely the same style. With the time, yes we can be worried, because the secular state should reflect secular society, and this secular society, with the time, if you don’t get rid of those terrorists and these extremists and the Wahabi style, of course it will influence at least the new and the coming generations. So, we don’t say that we don’t have it, we’re still secular in Syria, but with the time, this secularism will be eroded. Charlie Rose: Mr. President, thank you for allowing us to have this conversation about Syria and the war that is within as well as the future of the country. Thank you. President Al-Assad: Thank you for coming to Syria.